I think I first came across George Saunders, the American short story writer, in the late 1990s. Whenever I'd be reading an anthology of American fiction, or a special fiction edition of the New Yorker or whatever, it would be his story that would stand out. He was quite an obscure name at the time, though would become less so in the UK, via a column he wrote for the Guardian in the 2000s. I call him a short story writer, but some of them are pretty long, and some are "novellas", and now, in his late fifties (somehow I never really thought about whether he was older or younger than me), his first novel, a book in 166 voices "Lincoln in the Bardo." He came to Waterstones in Manchester last night and there must have been close to 120 people in the audience - an impressive number for an hitherto obscure writer. His books before the new one were hard to find, but when his last collection "Tenth of December" won the Folio prize, he obviously became better known. Like a band that's been going for years, he's picked up fans along the way, and I guess the numbers shouldn't have been a surprise. (The equally brilliant Ben Marcus had around a quarter of this crowd a couple of years back - American fiction doesn't always travel.). It's fair to say he's having a moment. He read from the new book, or rather, a group of readers from Waterstones and the Centre for New Writing at the University of Manchester, read from the new book. Because its a book in many voices - the ghosts in the mausoleum where Abraham Lincoln's young son lay dead, whilst the American civil war raged on around him - this, which he's repeated in every city of his book tour, was a powerful and inclusive way of introducing the novel. Saunders is a well regarded creative writing tutor at his alma mater, Syracuse, where he studied under Tobias Wolff in the mid-1980s. A brilliant essay in the Guardian recently unpicked his approach to writing - don't lose the magic; try and turn the dial to make the work better, not worse; most of all, empathy - and he revisited a couple of these points in the Q&A with the university's Dr. Kaye Mitchell. He's a very open and funny speaker, and like alot of American writers, appeared relaxed and colloquial. I hadn't realised he'd come from a blue collar background or that his first degree had been a science degree or that he'd had a fallow period following his MFA whilst he tried to be a Carver-esque dirty realist, and as he says, "lost the magic." Talking about the new novel's long gestation and experimental style he felt that the latter was dictated by the subject - something I've always thought necessary. The crowd, with an above average number of beards and Americans, (there's an essay to be written on readers coming to look like the writers they like!) asked some illuminating questions as well including one about Audiobooks (surely a sign of the times?). The audiobook of "Lincoln in the Bardo" seems a thing of wonder - 166 different voices including a number of famous names, like Ben Stiller, and Jeff Tweedy from Wilco - The sense of this being a visit from American literary royalty briefly surfaced at this point - though his disarming manner, and the charm with which he invited co-readers along to share the spotlight, was distinctly humble. I need to go back to his short stories - and find time to devour the new novel. After a tiring week, and having missed another of my favourite writers, Gwendoline Riley, the night before, because I was at the Whitworth for an art opening, I'm glad I made the effort, bumping into a number of Manchester writers and literary types along the way as we scurried through the rain (sorry, George, we had to live up to the cliche) to find a bar away from the St. Patrick's day crowd. In B.S Johnson's "Albert Angelo" there's a point where the writer stops the narrative and says that it's all a lie. This "fourth wall" breaking is not entirely uncommon in fiction, but it's usually done with irony rather than sincerity. The Johnson intervention was probably more shocking for coming in the middle of a clearly autobiographical fragment. Ben Lerner's second novel "10:04" plays the same trick but gradually, as if he's been teasing us all along. You should see this in the context of the times: whether its that post-David Foster Wallace/David Eggars search for sincerity in an ironiced culture; David Shield's critique of fiction in "Reality Hunger"; or the selfie culture of the millenials. Lerner, a Generation Y writer, has already mined the over-medicated, self-aware present in "Leaving the Atocha Station." That kept the tropes of fiction. It was an imagined protagonist, an imagined story, and the unlikeable narrator was perhaps not one that any writer would like to too closely identify with as purely autobiographical. "Ben" in this second novel has removed the conceit of character. Two thirds through, he gives up any sense of doubt we might have by talking about this being a book written on the very edge of fact and fiction. We will come back to that. Here, a writer who has just had a story published in the New Yorker (included here - and the weakest section of the model - make of that what you will, make of the relevance of the New Yorker what you will) has been contracted for a second novel to expand that story. At some point we are told that is both that novel, and isn't that novel. It's the novel contracted for. But he decided to write this one instead. Like David Rose's "Vault" - which helpfully calls itself an anti-novel - this sees us given both the "real" version and the fictional version. Given that we have the former first, the New Yorker story seems contrived, made-up, lesser. Yet, of course, this is also a fiction, part of a larger work. But our Generation Y novelist has the same problems as the character in the story. He is sleeping with an artist who doesn't particularly like him (or he doesn't particularly like - it's far too casual to tell) whilst at the same time being asked to be the father (via other means than copulation) of a child for his oldest, closest friend. In the background, New York, where they are living is in trauma mode. It is hurricane season and these storms are landing. This disaster trope is a commonplace in post-eighties American fiction, ever since DeLillo's "White Noise" it seems. Yet whereas McInerney's "The Good Life" wonders what his archetypal New Yorkers will do after 9/11, or A.M. Homes sees the forewarned catastrophe of an earthquaked L.A. as an inevitable possiblity, Lerner's storms are like the dread in peak-period Martin Amis, likely events, without much consequence. The consequence is more about the narrator's health. He has been found to have a hereditary disease - and is undergoing tests. The medicalisation - this and the fertility treatment (his sperm turns out to be abnormal, still usable, but requiring work), create his interior tension. Yet if this sounds like some kind of newspaper columnist, mining its own life, it doesn't really do justice to the Lerner we met and admired in "Leaving the Atocha Station." For like "The Rings of Saturn" by W.G. Sebald we get photographs, digressions, other stories. This is the novelist as chef letting us look at how he cooks the meal, but we are not necessarily any the wiser how he does it. He holds back - mostly - from the kind of interruptions or digressions you'll find in the experimental novel from "Tristam Shandy" onwards. There are, to be fair, bits of this novel, that could be in an essay or a poem (the poem he writers whilst on a writers' residency is included.) This multifariousness of consciousness is a strength rather than a weakness. For Lerner the slightly neurotic millenial self-obsessive is less interesting than Lerner the inquisitive renaissance man. Like David Eggars' "A Heartbreaking work..." we are asked to believe in the irony as a way of deflecting from the sincerity. Let's be honest, this too is a novel of nostalgia. He talks about childhood obsessions: the over-emphasised film "Back to the Future" which seems to have become some kind of ur-movie for people of a certain age (rather than a nostalgic piece of fun); the mis-labelling of the Brontosaurus and a childhood obsession with dinosaurs. These obsessions are both specific and generic. The worrying thing might be the over-emphasis that Lerner puts on them: searching it seems for a Rosebud moment. He does the same trick with literary precursors, Whitman and Creeley, and yet part of this is a private mythos. The "writers residency" is told half as a diary entry of some kind of collapse and half as war story, as he goes to a proto-typical literary party whilst in Texas, where an intern takes to much Ketamine. So much of this could be self-indulgent, and a couple of parts -the writing of the poetry, the story within a story - seem weak by comparison to the sheer brio of the rest of it. The title comes from "Back to the Future" but he can't let a single reference point alone, and links it to "The Clock" - a 24 hour movie in "real time" by Christian Marclay, which takes real time scenes from a myriad of movies and edits them together. The specificity of the reference, like Nicola Barker's "Clear" (David Blaine's transparent box in London) seems anachronistic already, yet also makes some kind of sense. Oddly enough the British cover sees "10:04" as a "24" style digital clock against a stark black background, whilst the American cover, referred toexplicitly in the narrative, is a photograph during the second storm, of downtown New York, and the Goldman Sachs building. In this sense: a cover photo self-referenced in the narrative is abandoned by some weird stupidity of its British publisher as not mattering. It matters. It matters, because we are being asked to take this novel as being a kind of truth, and this makes one part a lie. Like "Leaving the Atocha Station" there is an immense pleasure in reading Lerner - his willingness to stretch our view of what the novel can be. Like David Mitchell or Junot Diaz or Jennifer Egan, there seems an ability to include anything and make it work. Such brio is always fantastic to read. Yet, the overall "thing" the novel is about (apart from the many other things it's about) does seem to be a familiar trope: of how to make sense of your life in a world full of change and chaos. Yet the chaos is a manufactured one to some extent. That neurotic realism we see in so much contemporary writing lacks a sense of real jeopardy. The young man in "Leaving the Atocha Station" imagined and pretended his mother was dead. In this novel, the writer of that "fiction" recalls the real life event which might have caused him to think of it - or to invent that - a story that his father had told him. This playiing with fiction - or what is real and what is fiction - seems quite a collosal achievement, and yet in many ways Lerner achieves it through echoes of much more conventional narratives: the plot giving some kind of sense to the chaos of life. Unusually for a poet-novelist, Lerner seems particularly adept at exploiting the possibilites of fiction and at times you feel - like with Sebald - that this is some kind of new form; yet ironically its the reassuring bits (that troubling mediocre "New Yorker" story) that let him down. It's a dense, satisfying, incredibly entertaining (and funny) read, and I suspect we'll see other books echoing it (poorly) in the years to come. It's a wonderfully expansive read, that despite its occasionally flaws, seems miles ahead of what we so often see in contemporary Anglo-American writing. Perhaps in the 1980s or 1990s there was a sense that contemporary poetry was made by a few hands, who were the annointed ones, shuffled into publication by Faber or Carcanet or newcomer Bloodaxe, or perhaps one of the small lists of the majors. You had to be an initiate to know what else was going on - the small press magazines, the pamphlets and chapbooks. Anyway, the majority - if not all - of the books above are from the 21st century, from a range of presses - though with quite a number from Knives, Forks and Spoons, whose photo frame covers are pretty distinctive in the above picture. I've been deliberately selective, so left out - mostly - the major poetry presses, though there's a Jack Underwood pamphlet from Faber to the bottom right, and Heather Phillipson's debut collection from Bloodaxe up top left, and Christian Bok's bestselling "Eunoia" in red near the top. 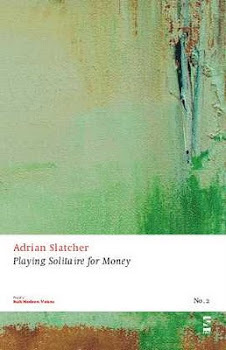 Notably this shied away from the usual Bloodaxe cover style, appropriately enough for a poet-artist. Other presses of note include Penned in the Margins and Salt, the latter no longer publishing poetry, and here represented by one or two of their "Salt Modern Voices" series, which I was also published in. I was just rearranging a few tottering shelves and before they all came crashing down, decided to lay out some of these and take a photograph. It's an impressive haul, around 60 books and pamphlets in total, probably less than half of the ones I've snaffled away from readings and mail order over the last ten years. There's a few interesting ones here. In the middle, between Leanne Bridgewater and Chris McCabe, with the patterned cover, is one of the "Stop Sharpening Your Knives" anthologies - #3 from 2009 - which brought a spotlight on a number of (mostly it seems) London based poets including Emily Berry (now editor of Poetry Review), Heather Phillipson, Jack Underwood, Joe Dunthorne, and Sam Riviere. McCabe's debut - from Salt - had a number of poems that we published in "Lamport Court" - and his other book here - the "book in a box" "Shad Thames, Broken Wharf", in brown to the right, an uncategorisable "play in voices", shows again how contemporary poets and presses have been inventive with their design. 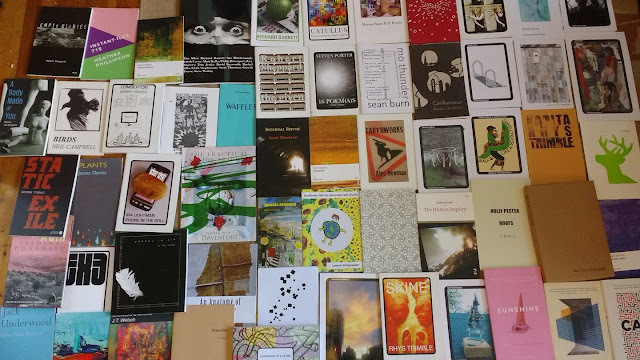 There are other books I'd forgotten: a pamphlet from Amy de'Ath, on the right with the green stag's head on its cover; Matt Welton's pamphlet for eggbox publishing, and "Waffles", in light blue to the middle left. A survey of contemporary poetry would have to take a lot into account I think - not just the "award winning" books that dominate the prizes. Note there are no Capes, no Picadors here that I can see; those lists, having only limited interest to me. Poetry requires reading rather than synopsis.